Caution: For serious Peanut Butter Lovers only! These cookies look pretty innocent at first glance, don’t they? 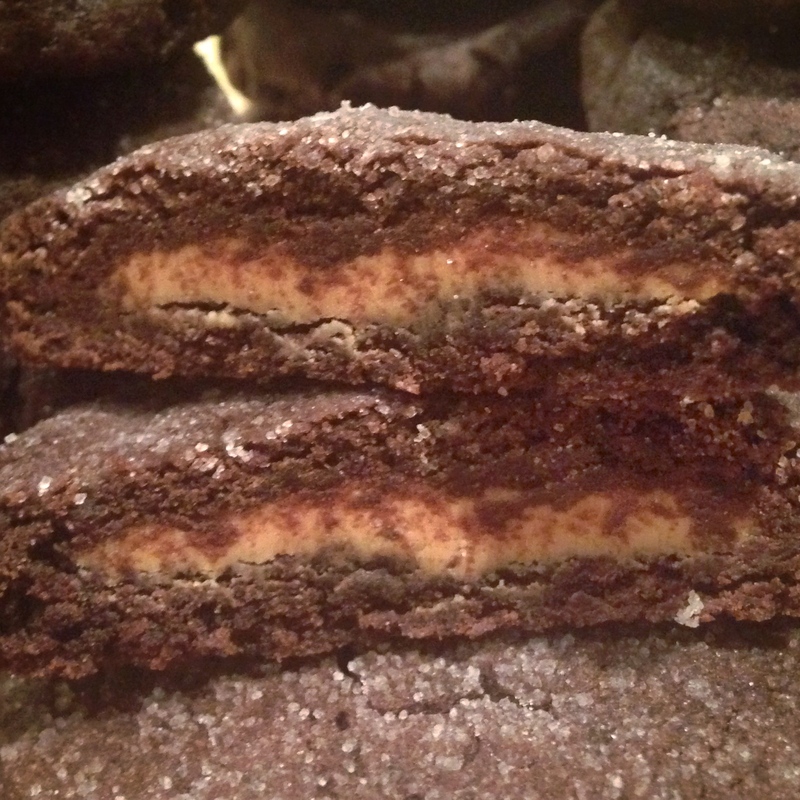 These cookies are crazy good, and once you make them, I think this recipe is one you’ll go back to again and again. 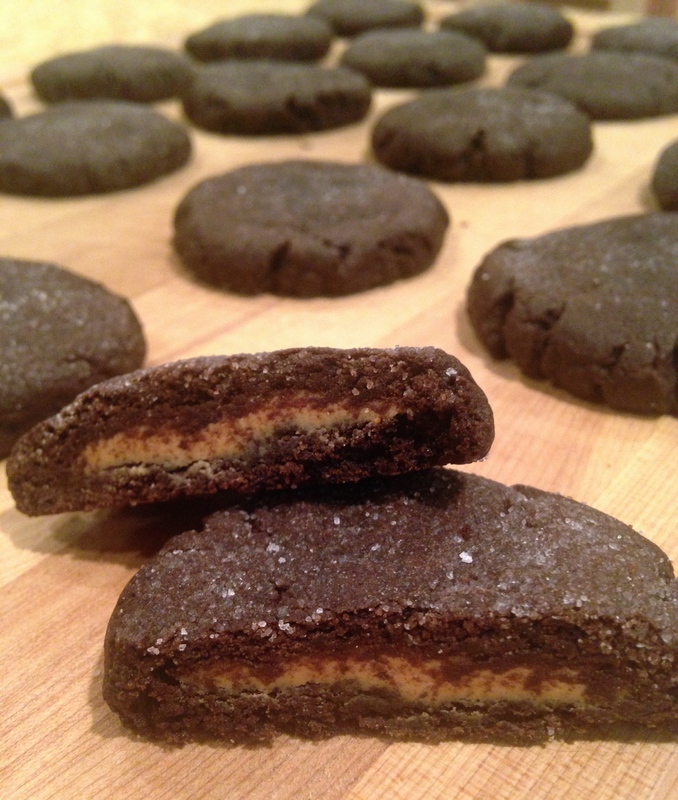 I feel like if a mother made these for her kids, they’re the kind of cookies that the kids would ask for week after week until they became a family favorite, which the kids would then make for their own kids years later (unless said kids happen to be some of those freaks who don’t like chocolate + peanut butter). 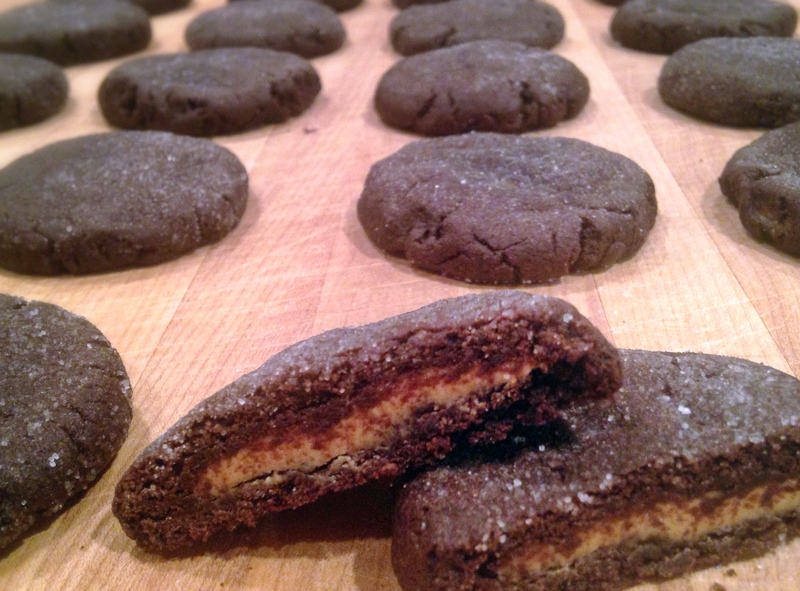 Begin by making the chocolate peanut butter cookie dough. Mix together flour, cocoa powder, and baking powder in a small bowl. I used half regular cocoa powder and half dark chocolate cocoa powder to give the chocolate flavor extra depth, but you can definitely use all regular cocoa powder. As a general rule, I always recommend sifting dry ingredients – ESPECIALLY cocoa powder – because you don’t want there to be clumps anywhere. 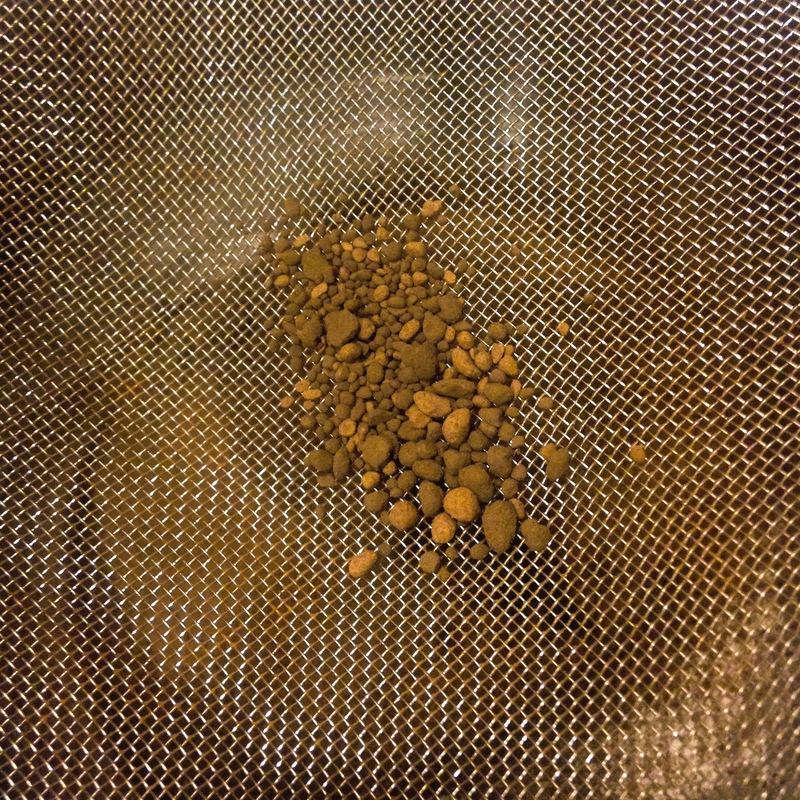 Look how many small clumps of cocoa powder were left after I sifted my dry ingredients! Next, beat together white and brown sugars, butter, and peanut butter until light and fluffy. Then beat in vanilla, egg, and milk until well combined. Slowly mix in the dry ingredients until fully incorporated. Now make the peanut butter filling. 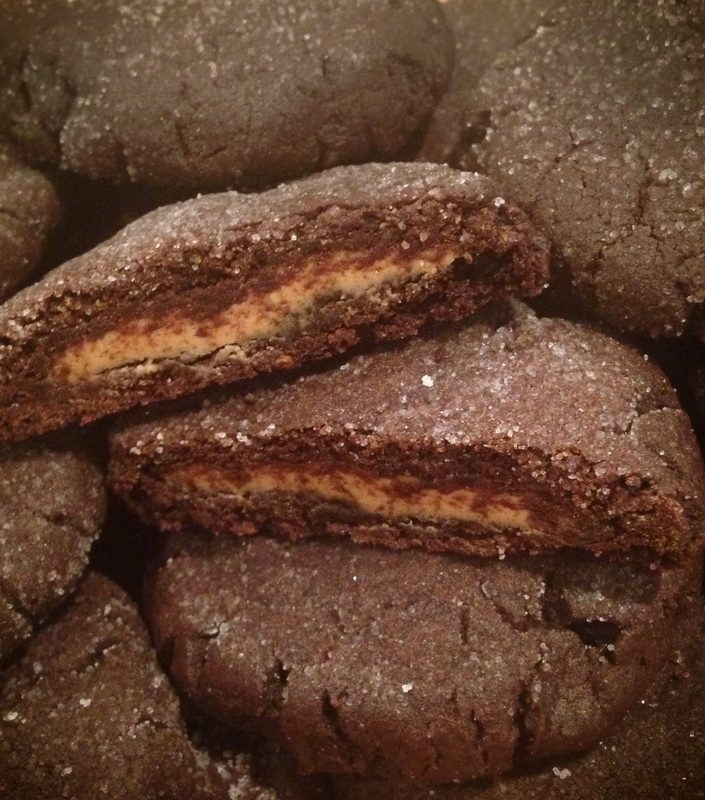 Super easy: just beat together peanut butter and confectioner’s sugar until fully incorporated. Keep mixing until the little pieces of peanut butter and sugar start to come together and form a few large pieces. Once combined, roll the filling into about 25 small balls, approximately 1/2-3/4″ each. 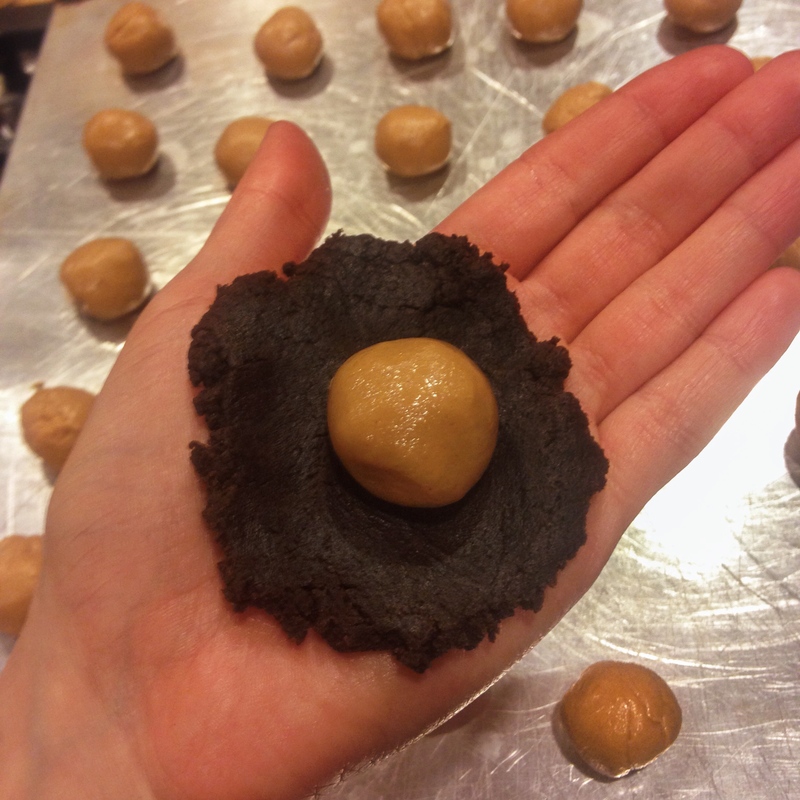 To complete each cookie, first take about twice the amount of cookie dough as the size of each peanut butter ball, and flatten the dough into a disc in your hand. Place the peanut butter ball in the center of the disc, and close up the cookie dough around the peanut butter. Roll into a ball, making sure the peanut butter is completely covered. You’ll want to be pretty stingy with the cookie dough so you have enough to cover all of the peanut butter, so use as little cookie dough as you can for each. Place the balls of cookie dough on a cookie sheet and use the bottom of a glass to flatten each one. 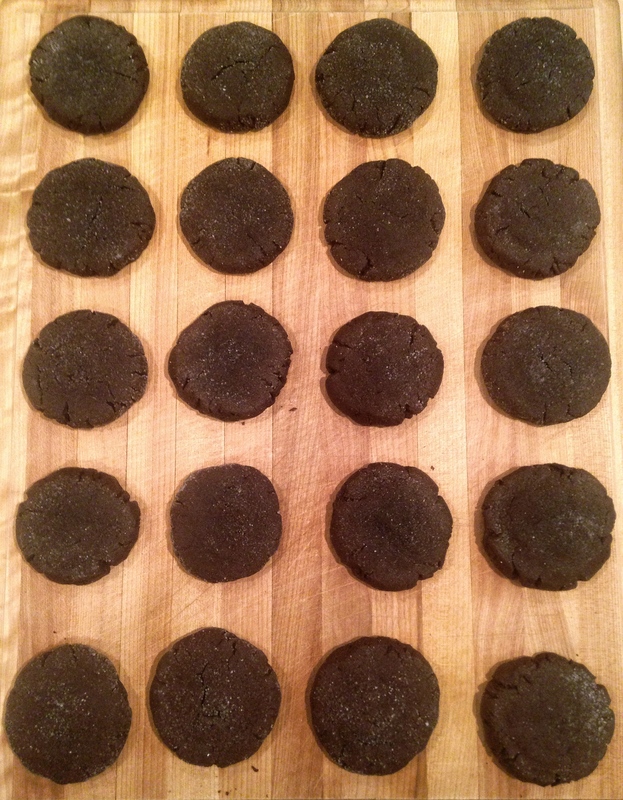 The cookies expand but don’t flatten out much in the oven, so flatten them until they’re almost how you want the cookies to look when they’re done. Notice in the picture below on the left, after I flattened the cookies there were some cracks around the edges. 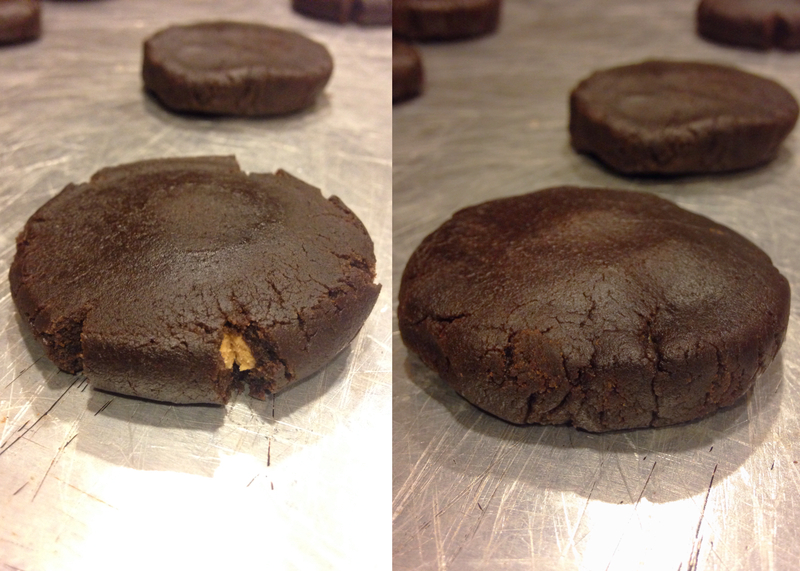 I went around each cookie and pinched the cracks closed, as seen in the photo on the right. I don’t know what would happen if you baked the cookies without doing this, but I think the peanut butter would probably be visible from the outside. 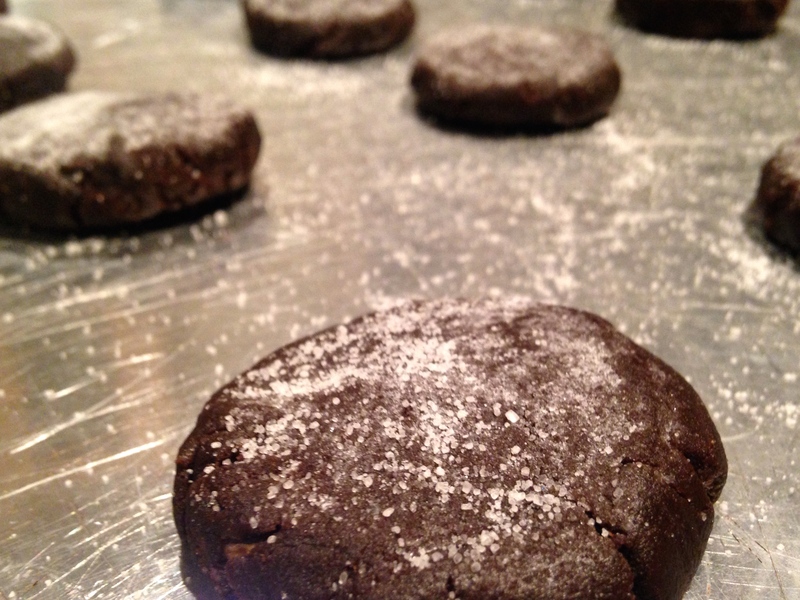 Then dip the top of each cookie into a bowl of granulated sugar, making a light even coating on top. Place back on cookie sheet. Bake for 7-9 minutes on 375 until the cookies are set and just beginning to crack. Allow to cool completely on the tray. 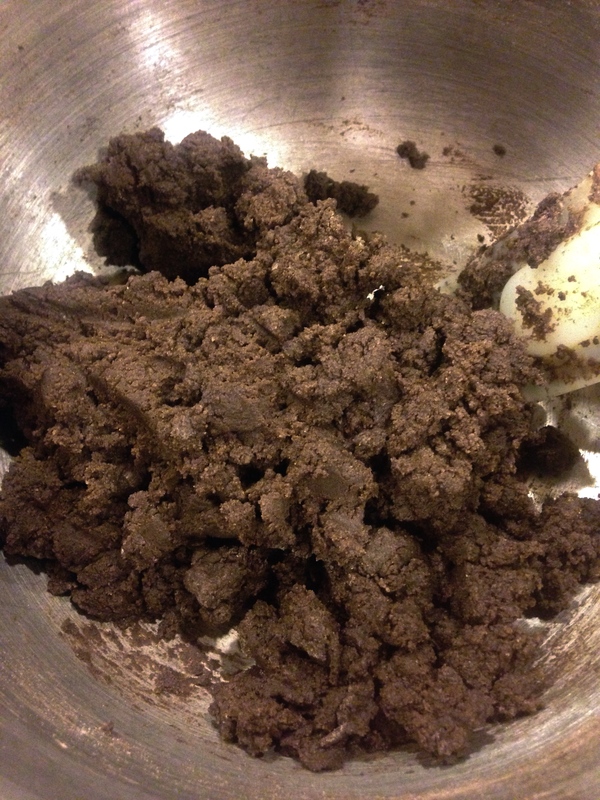 Make cookie dough: In a small bowl, sift together flour, cocoa powder, and baking soda. Mix until well blended. In a large bowl with mixer on high, beat together white and brown sugars, butter/margarine, and 1/4 cup of peanut butter, until light and fluffy. Next, beat in vanilla, egg, and milk until well combined. With mixer on low, mix in flour mixture until fully incorporated. 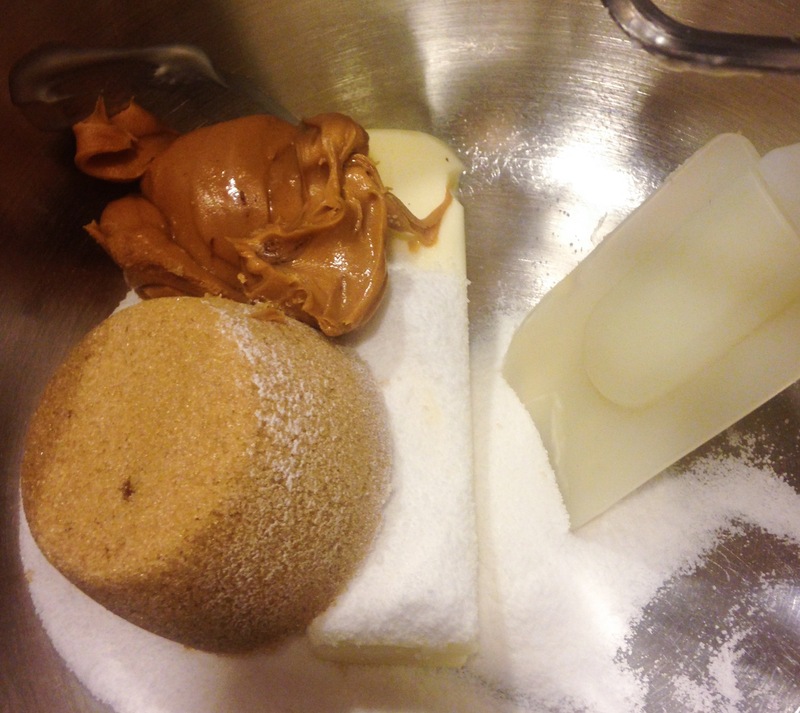 Make peanut butter filling: Combine confectioner’s sugar and 1/2 cup of peanut butter. Start with mixer on low and switch to high once sugar is mostly incorporated. Mix until fully incorporated, and the mixture starts to form several larger clumps instead of many little pieces. Make the cookies: Preheat the oven to 375. 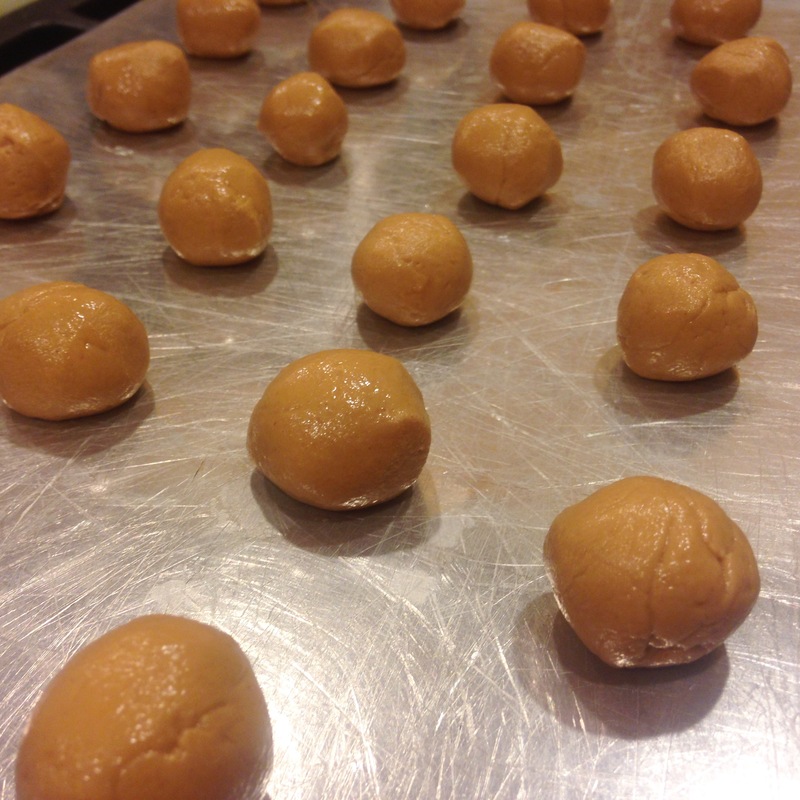 Roll the peanut butter filling into 25 balls, about 1/2-3/4″ each. Take about twice the amount of cookie dough and flatten it into a disc in your palm. Place a peanut butter ball in the center, and then wrap the cookie dough around the peanut butter and roll into a ball, covering peanut butter completely. Place completed cookie dough balls on a cookie sheet, a few inches apart. Use the bottom of a glass to press down and flatten each ball. The cookies don’t flatten out much in the oven, so press down until the cookies are almost the shape you want them to be when they’re done. Then press the top of each cookie into a small bowl of granulated sugar, getting a light even coating. Place back on cookie sheet. Bake for 7-9 minutes until cookies are just set and beginning to crack slightly. Allow to cool on tray.